In 2011, we were tasked with the re-launch of a well established family business and funeral home in Albany WA which was in the final stages of a complete facility rebuild. The building included an overall larger facility, a chapel, a gathering area and new transportation mechanisms. Bethany Funeral Home has very specific cultural values and the whole treatment required sensitivity and subtle marketing. Being a funeral home, the sensitivities were certainly different to other clients and this needed to be present in the brand design and promotional strategy. We had been impressed with our client’s values and attitude relevant to their core business. Sensitive to others needs, our client believed that a funeral service should be a celebration of a person’s life. Conducted in a dignified spirit of thankfulness for the privilege of life, the memories always remained and the love never ceased. It was the sentiments expressed within Bethany’s values, from which our team continue to draw ideas and inspiration – from developing the positioning, promotion and projection of Bethany Funeral Home, the values became our point of differential. Jack in the box commenced its program in 2011 by conducting detailed market research, followed by the development of a marketing and promotional strategy. Various members of the Jack in the box team spent significant time with the client and his team in an effort to gain a deep and thorough understanding of the culture and the requirements of the brand and the promotion. Following this in-depth discovery, we completed a redesign of the brand and corporate styling. All the livery requirements were initiated ready for the new building launch including signage, vehicle ID, brochures and the creation of a new website. Since then we have developed a number of innovative and thought provoking TV campaigns along with an award winning children’s publication. 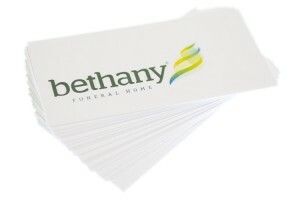 Bethany Funeral Home recorded an immediate increase in market share, which has continued to be sustained. The organisation now dominates the market place in Albany and is well respected for its approach to clients, family and those associated with the loss of a loved one. The building and its accompanying brand is accepted by the community as harmonic with the culture of the organisation and its appeal to those in need has helped realise significant increases in performance, which has been maintained. Jack in the box continues to enjoy a business relationship with Bethany as its marketing and advertising agency. The most recent Bethany Television Commercial received international accolade in the form of a BRONZE Summit Creative Award. Our other 2017 campaign, the Bethany Children’s Storybook was also internationally awarded, receiving a SILVER Summit Creative Award.